Or ask at your local quilt shop! “No. 50,” “50 weight,” and “50/2” may all mean the same thing—or they may not. For The Quilter’s Appliqué Workshop, I group threads into general categories of size and refer to them by a number that’s simply a rough consensus among the various manufacturers’ labels. This is a system of convenience rather than technical accuracy; the technical details are well explained in YLI’s “Thread of Truth” booklet. The examples given in the table are threads I’m familiar with, but it’s by no means exhaustive—your thread stash will likely include others. Size 100 Very lightweight thread, good for hand appliqué. Size 60 Finer (lighter-weight) than regular sewing thread, often called fine machine-embroidery cotton or bobbin thread. Size 50 General-purpose sewing thread. Some variations in thickness exist between brands. Decorative threads, somewhat heavier than regular sewing thread. Cotton in this category is often labeled as machine-quilting thread. Note: 40wt rayon and polyester machine embroidery threads are generally somewhat finer than sewing thread. Size 30 Even heavier decorative threads. Cotton in this category is often labeled as machine-embroidery thread. Size 12 Very heavy thread, probably about the limit of what your machine can handle in the needle. Also suitable for hand embroidery. 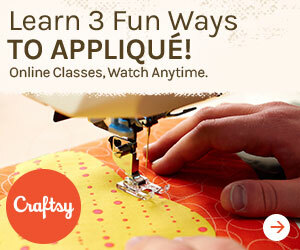 Get personal help with your appliqué in my online class! A perfect companion to my book. The Quilter’s Appliqué Workshop is published by Interweave, a part of F+W Media. Copyright © 2014 by Kevin Kosbab. Photography from the book copyright © Joe Hancock. Copyright © 2014 - 2019 Feed Dog Designs. All rights reserved.